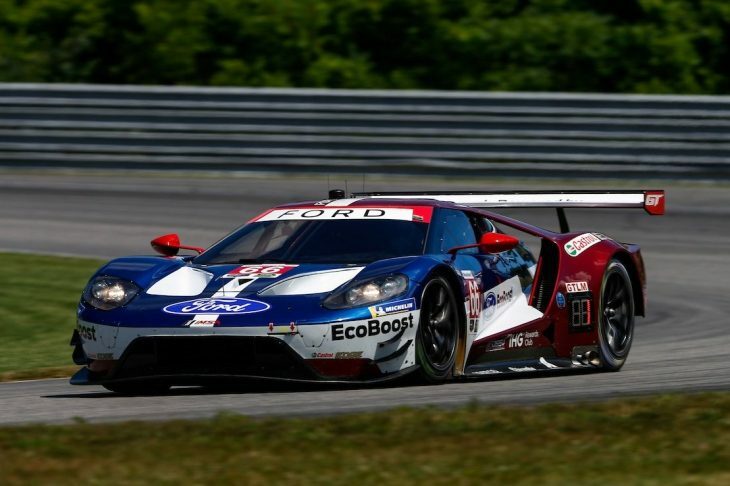 For the third WeatherTech SportsCar Championship race in a row a Ford GT topped the charts in GTLM, this time however it was the #66 with Joey Hand and Dirk Mueller who claimed the win at Lime Rock Park and the lead in the GTLM championship after the sister #67 won at CTMP last time out. Mueller started the car and handed it over to his teammate after one hour of the two hour, forty minute race. For much of it seemed that the #3 Corvette C7.R, which started on pole, would take home the win. Joey Hand though was able to chase down Jan Magnussen in the race’s final half hour, and take the lead lead with a move on the exit of the final turn when Magnussen ran wide and onto the dirt. 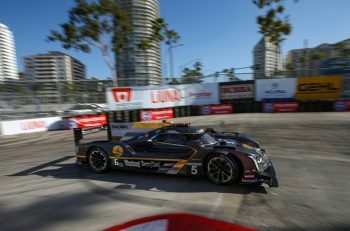 From there, Hand was able to create a comfortable lead, Magnussen unable to respond to the pace of the American, having to settle for a second place finish in the #3 Corvette C7.R. Third in GTLM was the #912 Porsche 911 RSR of Earl Bamber and Laurens Vanthoor whose chances of a better finishing position was hindered by a slow final pitstop. The crew was unable to attach the right-front tyre of the Porsche, forcing the mechanics to switch wheel guns in the middle of the stop costing Bamber about six seconds, enough for that car to lose second in class. The pair of RLL BMW M8 GTEs struggled for pace most of the day, and with only one Full-Course Yellow on the race’s first lap there was no opportunity for strategy calls to try gain better the position for the two cars. The #25 BMW M8 GTE came home in seventh, with the #24 BMW M8 GTE (running a special black livery) had to deal with a loose bonnet for much of the second half of the race. That car finished eighth in class, behind much of the GT Daytona field. In the GTD field it was the championship-leading #48 Paul Miller Racing Lamborghini Huracan GT3 with Madison and Bryan Sellers which took home the win, in what was a remarkable turn around for the team, after its Huracan had to undergo an engine change on the Friday. “It’s just a big moment for us… Madison was really good over the stint and once we got in clean air we had really good pace. We had much less tyre degradation than the others,” said Bryan Sellers. 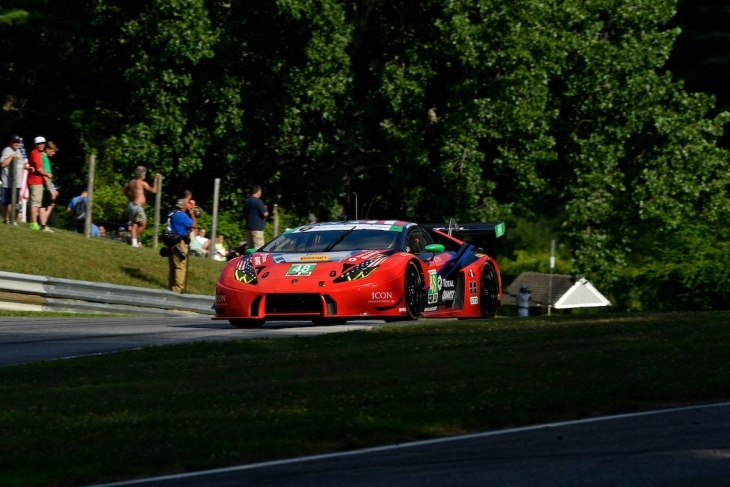 A pair of strong pitstops and rapid pace in the first half of the race put that car in great position to take advantage of the green flag racing and further extend the team’s championship lead with a win at Lime Rock Park. One of the surprise performances of the race was the #44 Magnus Racing Audi R8 LMS GT3 which started the race second-to-last in class and worked its way through the field to finish in second, with Andy Lally bringing the car home. Rounding out the GTD podium was the #63 WeatherTech-sponsored Scuderia Corsa Racing Ferrari 488 GT3 with Gunnar Jeanette and Cooper MacNeil at the wheel. Further back, it was a disappointing outing for the pole-sitting #58 Wright Motorsports Porsche 911 GT3 R. The tema held the lead for much of the first half of the race but ended up coming home eighth in class after struggling with gearbox issues during Patrick Long’s second stint. There was only one Full-Course Yellow and it came on lap one as the result of contact between the #93 Acura NSX GT3 with Lawson Ashenbach being pushed onto the grass by the #96 Turner Motorsports BMW M6 GT3 which was driven by Bill Auberlen at the time. 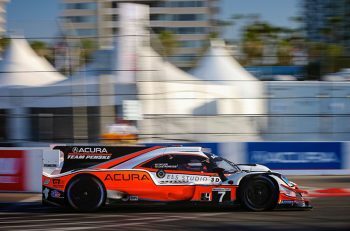 Once the Acura was on the grass Aschenbach had no control and made hard contact with Auberlen, both cars’ retiring on the spot. 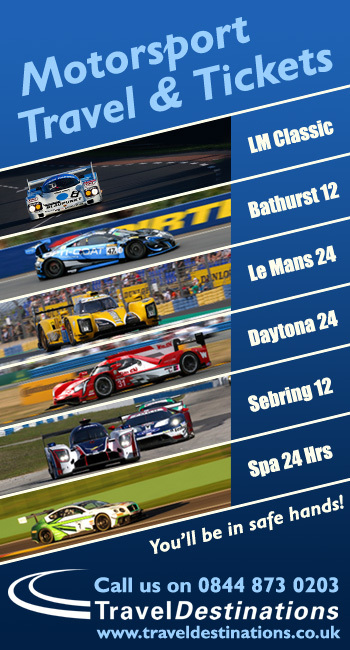 The next round of the IMSA Weathertech Sportscar Championship is on August 5th from Road America in Elkhart Lake, Wisconsin where all three classes will once again be present.